Condoleezza Rice on Saturday pulled out of giving the commencement address at Rutgers University after professor and student protests. Rutgers historian Professor Rudy Bell argued that while it would be appropriate to have Rice on campus as part of an academic debate, she is unsuitable as a commencement speaker because of her role in an administration that launched an illegal and destructive war and practiced torture. He said, “Commencement is a day when we honor the graduates, who have accomplished so much. It’s a day when there should not be controversy.” He also pointed to her role in an administration that practiced torture. Some 50 students occupied the offices of Rutgers University’s president last week in protest. Professor Bell is being polite. 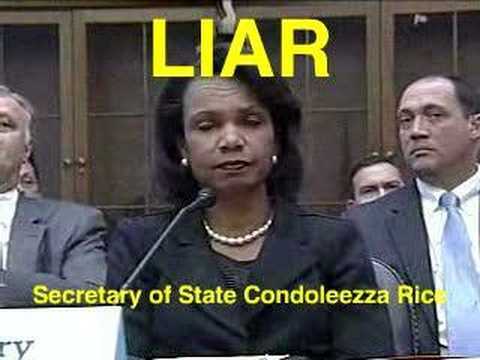 Dr. Rice is a war criminal in international law. She played a key role in launching a war that contravenes the United Nations charter, which requires that use of force against another country come either in self-defense after an attack or be authorized by the United Nations Security Council (as was the case with the Gulf War, Afghanistan and Libya). Even if one took seriously the “responsibility to protect,” which some feel justifies a humanitarian intervention to stop an ongoing genocide, there was no massive humanitarian crisis in 2002 in Iraq that justified a foreign invasion. Nor did any large international organization back the war in Iraq– even the US’s NATO allies were almost universally opposed (excepting the UK and some recent Eastern European additions, who also cooperated with Bush’s torture program). Not only did she back an illegal invasion and occupation, she did so on the basis of a set of falsehoods. She retailed 56 distinct falsehoods to the American people. She warned that we do not want the smoking gun for Iraq’s (non-existent) nuclear weapons program to be a mushroom cloud, a piece of war propaganda that would have caused Goebbels’ heart to swell with pride. As then Rep. Robert Wexler argued, Rice had at hand intelligence that contradicted her talking points, but always made a forceful case for war. She even had the US public convinced that poor, weak, ramshackle Iraq, lacking a navy or air force and under severe economic sanctions for a decade, posed an existential threat to the United States. Rice’s actions established a precedent that has been cited by Vladimir Putin for his intervention in the Ukraine, and so contributed to a profound weakening and deterioration of the framework of international legality that the post-World War II generation, including Dwight Eisenhower, attempted to erect. I’m with Rudy Bell, that campuses should be open to all kinds of people. But when we bring war criminals, it should be at least in part to debate with them their criminal actions, not to honor them with a doctorate and give them $35,000. And graduating students at a liberal arts university deserve to hear from admirable people, like Foreign Service Officers John H. Brown and Peter Van Buren. High office does not mint a person as an exemplar. It is a platform for potential achievements, and where it is used for death and mayhem and illegality, it is a badge of dishonor.